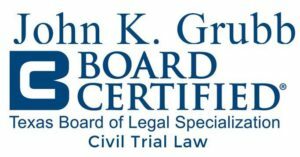 Family law attorney John K. Grubb is not only a seasoned high asset divorce lawyer, but he is also board certified in Civil Trial Law by the Texas Board of Legal Specialization offering aggressive divorce representation. Over his 30-plus year career, he has appealed many cases to the Court of Appeals and Texas Supreme Court. You do not need to keep your former divorce attorney for an appeal; you should investigate lawyers to find an attorney most qualified to appeal a family law case. When Can You Appeal a Divorce in Texas? How Long Do You Have to File a Family Law Appeal? Can You Change a Divorce Decree? If you are looking for options and solutions about how to appeal your family law judgment, contact the Houston family lawyers at our firm today for a consultation. We are happy to offer you our experience, opinion and advice with regards to your appellate options. We represent clients for family law appeals throughout the greater Houston area, including Harris County, Montgomery County and Fort Bend County, Texas.